It’s that time of year again; the month when the Fitter-Than-Thous (FTT’s) flex their snark muscles and chastise those who step into the gym for the first time in January. You’ve probably heard it or even seen it on your social feeds; snide comments about the place being a zoo in January and a ghost town in February suggest that people who increase their frequency at the gym in the beginning of the year don’t really mean it. Such statements might be spawned from frustration over crowded cardio machines, newbies in the weight room interrupting routine, or impossible-to-find-parking spaces. Or, it might just be an excuse to humblebrag; reminding all of us of how committed the FTT is to the gym process all year round. Having been a group instructor for years I’ve heard many “whys” as to the motivation for newcomers in January. More often than not, it has nothing to do with New Year’s resolutions. It might be because she spent the summer and fall months training for -and completing- 3 marathons, but the cold weather and short days call for an indoor place to run during the winter. It might be because he couldn’t afford to belong to a gym but was gifted a 3-month membership for Christmas. When he stops coming in April it’s not because he’s lazy, it’s because the funds aren’t there. It might be because she got a job transfer and is new to the neighborhood. Selecting a new gym was a high priority for her. Turns out she just happened to select the same gym as you and it happened to be in January. It might be because he got laid off from his job a week before Christmas. While looking for new employment and figuring out what’s next he figures it’s a good time to make his health a priority. It might be because for two years she was battling an illness that would make your most badass workout look like a nap. She’s just trying to feel normal again, and it just happens to be January. It might be because that same person a year later willingly put her life on hold again to tend to her mother’s end of life struggles. Exercising is her only release and she’s been looking forward to being able to get back into it once the holidays are over. It might be because she was a member long before you and stopped attending when she had a baby. She’s been exercising at home but the baby is now old enough that she can return on a regular basis. 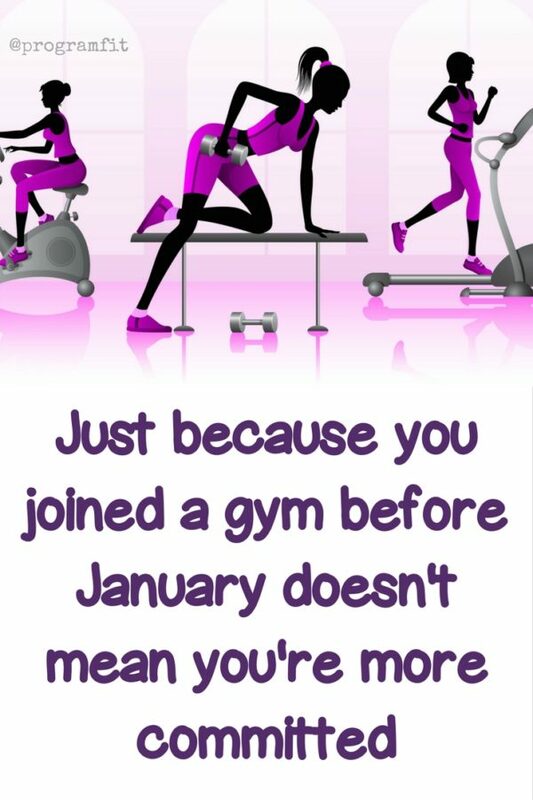 It might be because the gym you belong to was marketing and offering membership deals for the new year. Could you blame a person for taking advantage of a reduced rate? It might just be that October through December are crazy busy for many people. Between kids sports, school obligations and endless holidays and travel, many look forward to January as a much more predictable schedule – one in which they’ll actually use their membership. Or you could be right. It might be that he did resolve to make this the year he got fit once and for all. He wishes he made the decision long ago when you did, but he didn’t. This is his time. Whether you like it or not, you need new people to come to your gym. You also want those January newbies to stay all year long. After all, if a gym isn’t making money it won’t be able to provide new or maintain existing equipment, bring in new programs and classes or keep quality staff. And if your gym goes out of business, you’ll be the one looking for a new place to train. Let’s just hope it doesn’t happen to be in January. Trivia: How well do you know your workout video history? An oldies-but-goodies quiz about home workouts before the internet. “Dressed Up Drills” At-Home Workout DVD Available Now!